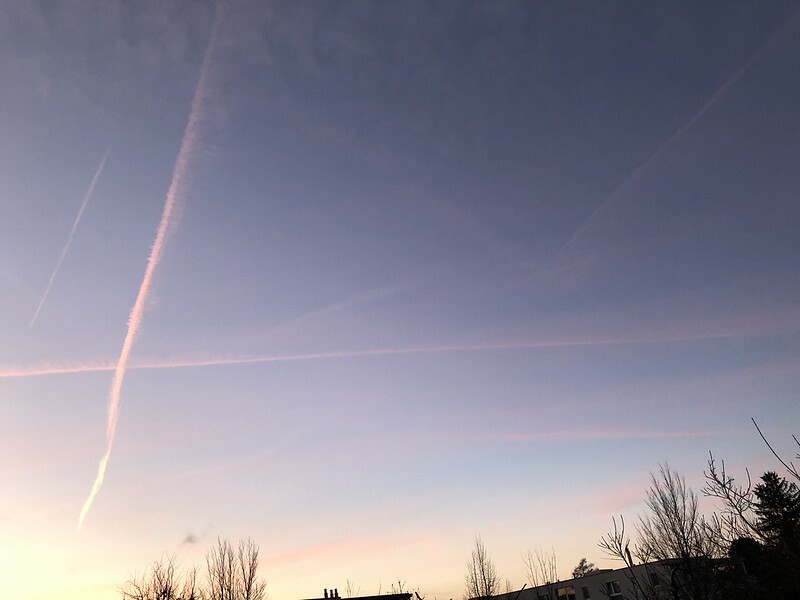 Just as I thought there was nothing worth a photo this morning I noticed that the planes from Geneva and Zürich airport had left their traces in the sky and the sun was reflecting it all in red. The sunrise is always an event in the morning, if you can see the sun. 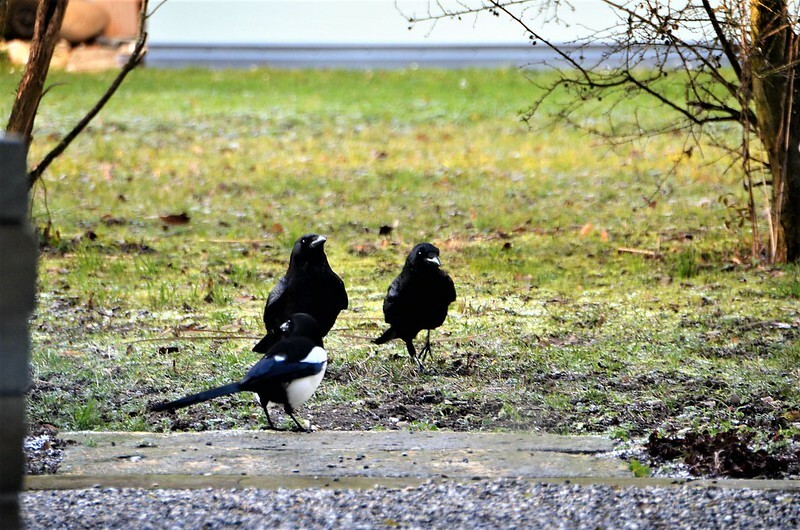 Yesterday I managed to get a group photo of 2 crows and a magpie in the morning. They usually appear seperately, but this time they were together. Actually they very rarely have disagreements and the magpies seem to realise that it is always crows first. And now to prepare for my Friday shopping trip. I must really go now. Tomorrow No. 2 son, wife and grandson are visiting and mama will be cooking. The only excitement I had yesterday was going with No. 1 son to at last deposit all the glass bottles and jars, with the empty cans from the food over the holidays. Since I am having to do everything on my own now, I had to leave it for a while and I had two bags full. No. 1 son always accompanied Mr. Swiss on that outing so he knew what to do and where to do it and I was glad. It is all well organised in the village with a parking space for the car. No. 1 son did the necessary and I watched as he carefully put the clear glass in a separate container as the brown glass. We went straight after lunch to get it dealt with and now I know how to organise myself with the car. Another obstacle out of the way. The next big step for me is tanking up my new car. Yesterday morning the guy that sold me the car at the garage called me on the phone to ask how I was managing with the car and whether I had any problems, which I thought was a very good customer service, although we have used this garage for at least 40 years. I told him I was very satisfied, and had the chance to clarify a couple of small details. And now I am off. Have a good day everyone and do your best to enjoy it as I will. Amazing pictures. Have a good day. Have a good day. The descriotion of yoyr ohoto sounds lively. The sun is shining, the shopping is done and lunch cooked and eaten. If I am not too tired this afternoon I might go places. The light in the trees looks good. I depend on my son normally, but he is not allowed to carry or lift any weight — even a little bit. Garry was in the same position for a month. He tried and he felt like his head would blow up. Owen isn’t willing to take the chance because it might undo the surgery. Garry’s left shoulder is damaged and he’s getting an injection tomorrow, Mine has done pretty well for my right arm. I’m hoping a series of injections may really help both of us, Oh blessed be lidocaine & cortisone! IF the injections help, we may get a little movement back. When it doesn’t hurt a lot, it’s amazing how I can do things like … gasp … WALK. I would love to be able to walk when the weather is warmer. It is rare when anything gets better when you are our age or older. But Garry can hear and my arm doesn’t hurt. The run of prednisone left my hips in much better condition. If it goes well, I might make an appointment in Boston and see if my spine can be freed up a bit. I know there’s a limit to how much it will loosen up, but anything would be better than the rigidity I live with now. We might yet have a better decade than I hoped. I’ve been sick or recovering from major surgery for almost 20 years. I never hoped for any improvement and I’m afraid to hope too hard! Beautiful capture of the birds. Hope you are done with your shopping. Have a great weekend and enjoy! The lighting in that last photo is beautiful. What wonderful customer service you received on your car. Isn’t it strange that we are surprised to receive service like that? It is refreshing that that still happens. Safe travels in your new car. You are doing great! 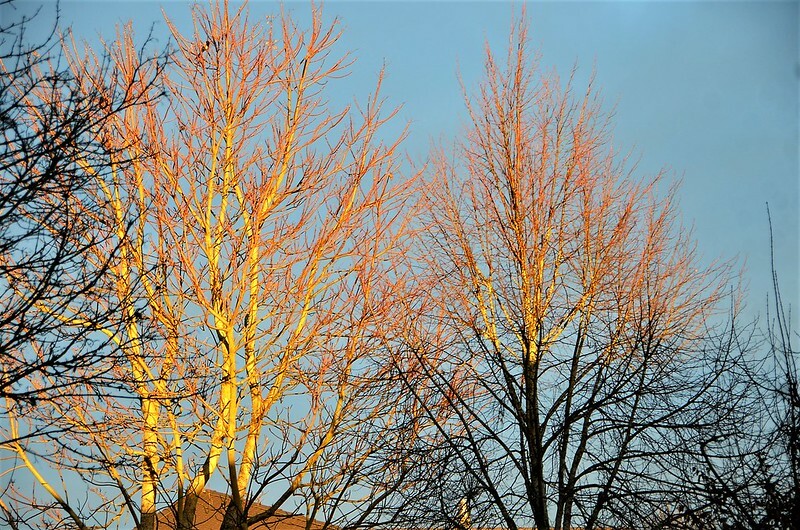 Love the light on the bare trees! I’m surprised some enterprising (younger) person has not thought of collecting the recycling and taking it to the centre – for a small charge – for those who find it difficult to manage. We have these places in almost all villages. If you get rid of it regularly it is not such a problem, but we collect it and bring it once a month- Most people can organise something. If you are invalide you have an orgaisations that looks after this sort of thing. The photo of the trees — wow! The sun was in the right place at the right time it seems. I think I want to paint it. Good morning. It will be raining after midnight, and for the next few days, so I should get some time to catch up. It does not rain much, but it does sometimes happen. The rain was delayed; and has not yet started. It should start any moment now. It is raining now; a few hours later than predicted, but that is just fine. My husband is a good wtercolour painter.He had lessons from an artist when he was a boy, but he also has the talent for paintining. Yeah will I guess soon we will see whether I have an innate talent for painting. I am not holding my breath.